We are seeing an era of unprecedented change in the way we work. Rapid advancements in the fields of technology, such as artificial intelligence and machine learning, and in how we create things, such as robotics, nanotechnology, 3D printing and biotechnology, will dramatically change the characteristics of the global workforce. 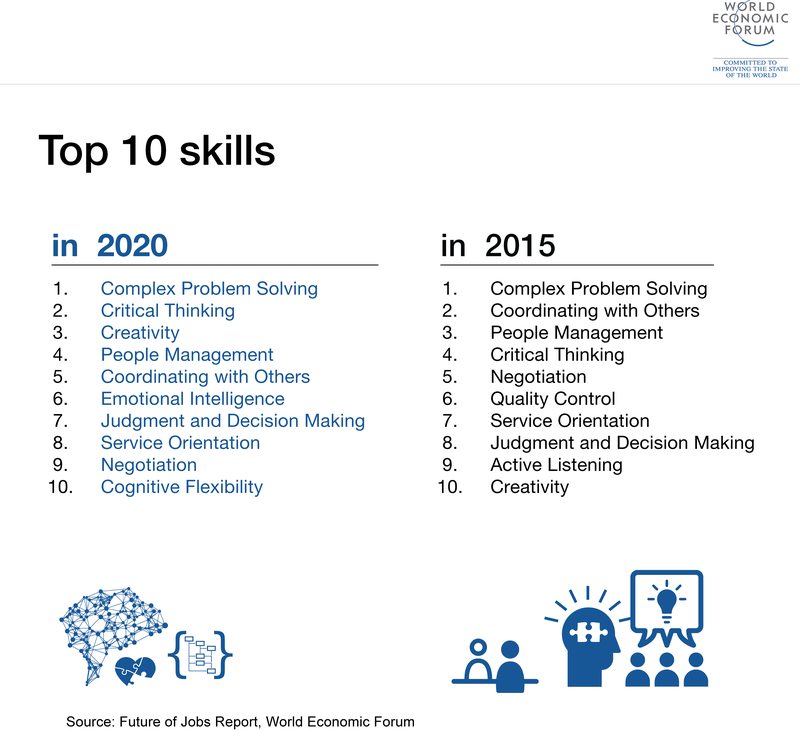 The Fourth Industrial Revolution is changing the workplace fast, and we will need to adapt our skills to be ready for it. What will happen to jobs? According to the Forum’s Future of Jobs report, some jobs will be wiped out, others will be in high demand, but all in all, around 5 million jobs will be lost. Already jobs exist now that had never been heard of five years ago: the role of data scientist, which is in huge demand, is one example. Other jobs will start to require skills not previously associated with them. Those working in sales or manufacturing, for instance, will need a better grasp of technology, thanks to the advent of the internet of things. 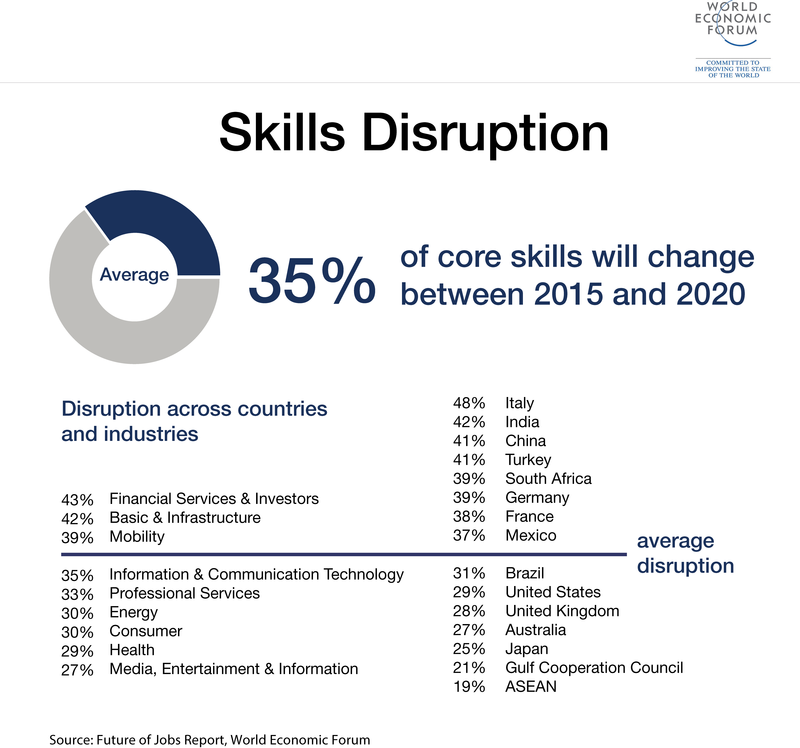 Everywhere we look, skillsets will need to be radically altered to keep pace with the changes taking place in the world of work. If businesses are to keep up with the disruption brought on by the Fourth Industrial Revolution, they will need to help their staff learn new skills. The businesses that thrive will be those that put talent development at the centre of their operation. Using data analytics, HR functions will need to learn how to look ahead, analysing skills gaps and working out how to align their workforce to meet current and future challenges. Workplace diversity will become even more important, and the shifting physical and organizational boundaries of the workplace will allow talent to be sourced globally – and remotely. The pace of change of the Fourth Industrial Revolution will vastly outpace those that have gone before. The impacts are already being felt, and, according to this report, most drivers of change will be well embedded by 2020. The need for urgent action is clear.